Washington has many wonderful fountains. The World War II Memorial’s may be the best at night. The Library of Congress’ Court of Neptune is akin to Rome’s Trevi Fountain. The ones on the sides of the U.S. Capitol are interesting. But one that often gets overlooked amid its setting is the U.S. Navy Memorial on 7th and Pennsylvania Ave. N.W. 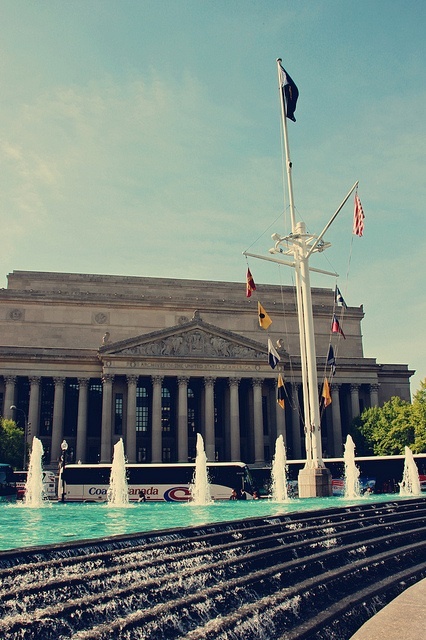 across the National Archives. The metro stop literally comes up to the fountains. The Granite Sea plaza has two shades to show land and sea areas. The scale of the world map is as seen by a spaceship 800 miles above Earth. The west pool honors international navies, the eastern pool remembers those serving in the U.S. Navy. The cool part is the pools are annually salted by water brought from each of the seven seas. In the plaza’s rear is The Lone Sailor. The bronze is made from artifacts from eight U.S. Navy ships. The seven-foot sculpture was created by Stanley Bleifeld in 1987 and modeled after Petty Office 1st clas Dan Maloney. The sailor wears a pea coat over his uniform with his canvas bag holding his possessions while waiting to board his ship. This entry was posted in Memorials and tagged Best Washington DC walking tours, Lone Sailor, Photo by Megan Snider, U.S. Navy Memorial, Washington D.C.. Bookmark the permalink.